We have the perfect hack to help you gift wrap a bottle very quickly. 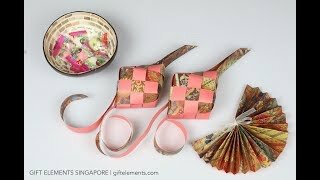 Basically, we used the same paper roll-and-flatten technique that we created to wrap any circular shaped objects. It makes evenly spaced pleats that collapse into symmetrical folds even on sloping surfaces like the neck of a bottle. This is not the first time we have showcased this rectangular Scan-N-Cut self-assembly favor gift box. We designeThis time we gave the box pattern a more modern look with the words “WITH LOVE” cut out on one side of the top lid. 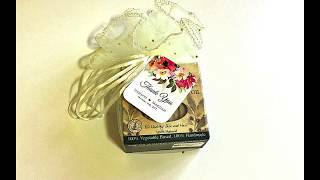 On the underside of the lid, we overlaid the cut-out words with a piece of patterned cardstock to bring out the typography.d the box pattern using the Brother Scan-N-Cut, and created stylish wedding favors with it. 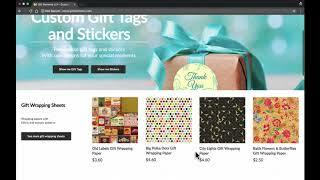 We are pleased to announce the opening of our brand new online store with custom stickers and gift tags. We have stickers and tags for weddings that can be personalised with the names of the bride and the groom. We were inspired to create this Scan-N-Cut pattern for a bracelet gift box because it can be frustrating when shops do not provide a box with the jewellery they sell. At least in Singapore, costume jewellery are usually packed in a drawstring pouch. 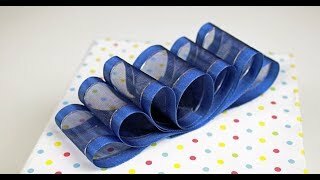 We made a quick and cute video on how to make a smart-looking bow called the Loops-In-A-Row bow. 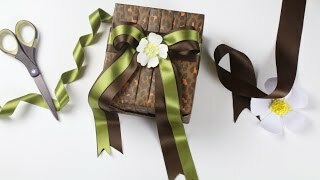 It is the perfect bow to decorate gifts for guys because it does make the gifts look quite dapper. Quick, elegant and easy! 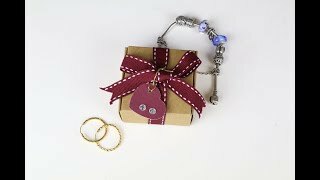 Watch how we wrap small jewellery in a few simple steps. Suitable for earring, pendants and bracelets! Show your loved ones how much you care this Valentine's Day with a beautiful gift that is sure to impress. It's never too early to prepare for Valentine's Day. 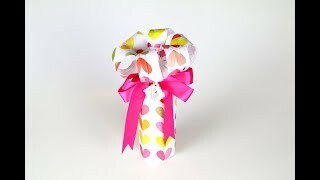 We are all hearts and flowers on this romantic day -- and that is exactly how we wanted our gift to look. 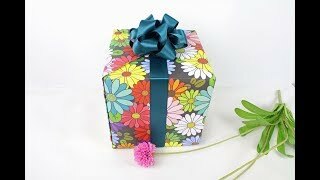 We used a wrapping paper with heart motifs and turned the cylindrical cookie tin into a flower by looping strips of the paper. Too pretty to resist! We thought it would be great to do a video of how we created the Japanese fanned-out pleats and layered look for the Elie Saab fragrance set. We used a wax-coated florist paper with gold and white stripes as the main outer wrapper. A panel cut out from our Golden Garden gold-stamped wrapping paper was laid underneath the fanned-out pleats. This immediately creates a contrast and the fanned-out pleats become more prominent. 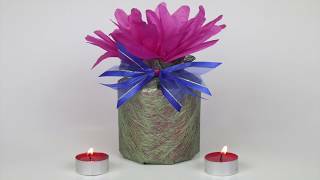 We combined a green non-woven wrapping sheet with a slight shine and a floral flourish made from hot pink tissue paper. The translucence of the non-woven sheet allowed some of the hot pink to peek through, which provided some harmony to these complementary colours. 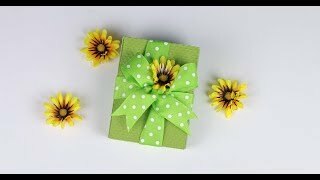 Our video this time (view it below) does suggest using the polka dot wrapping paper to make a gift bag for children’s parties or baby showers. On the other hand, we chose to use a black grosgrain ribbon with white stitching to tame the polka dot colours without losing any of their vibrance. Recently, we became the proud owner of a Brother ScanNCut paper and fabric cutting machine. We have been designing and cutting boxes ever since. At least, I am completely enamoured by the endless crafting possibilities. 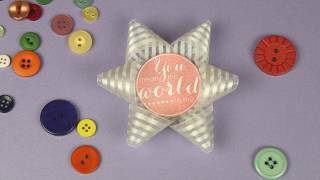 There are also numerous available template designs on the Canvas software that can be simply downloaded and turned into instant favour boxes. 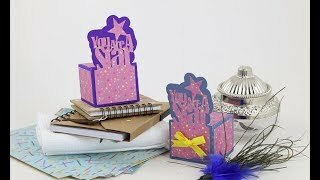 We shot a video footage on how we created a handbag favour box from one of these templates. 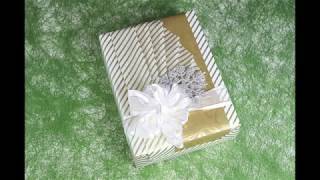 Buy this gorgeous wrapping paper here: http://bit.ly/2i1k739 Wrapping a circular gift is always a painstaking task. Most people resort to placing them in a standard gift bag -- which may be difficult to find the perfect size! 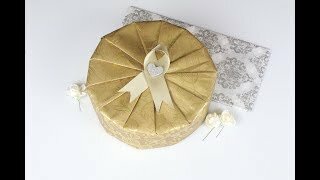 We have simplified wrapping a circular item using a unique technique that requires minimal sticky tape. All you need is a beautiful wrapping paper and a simple embellishment to make your gift look luxurious and amazing! 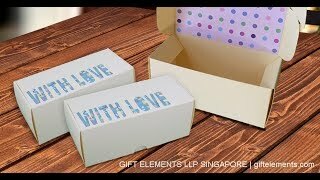 Contact us at giftelements.com for gift wrapping service! I am a child of the 1970s. The fact that we have been flooded lately with boho-style fashion is therefore simply marvellous. Say goodbye to monochrome and hello to a kaleidoscope of colours. We can’t wait to showcase some boho chic gift wrapping. We decorated the gift using a double-sided luxurious satin ribbon in teal made into a luscious bow. The more sombre teal hue added a touch of subtlety and sophistication. The riot of colours is suddenly tamed and ended up looking pretty classy. The month of Ramadhan is coming to a close and the feast of Eid falls on Sunday, 26th June 2017, in Singapore (and most of South-East Asia). 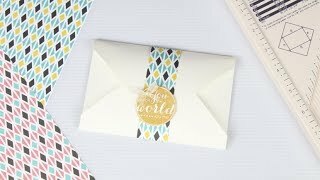 We made a quick video showing how to make a cute party favour from paper weavings and filled it with little bonbons. The weaved casing is inspired by the “ketupat”, which is a Malay rice cake cooked in a casing weaved from the long, slender leaves of coconut fronds. 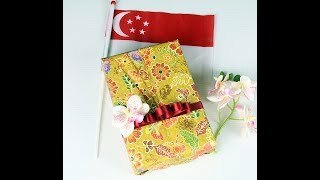 We used our Country Strong Batik Wrapping Paper (19 inches by 27 inches) that has two sides. One side is printed with various batik patterns and the other side is entirely printed with a dusky pink colour. Basically, we made a one-layer star gift bow and placed a circular sentiment tag in the middle. Why is it called a star gift bow? This is because it is made using a template that looks like star. We used a 6-pointed star template to create a bow with 6 loops. If you want to create this template on your own, it measures 5 inches tip-to-tip along the longer vertex and 2.5 inches tip-to-tip along the shorter intersecting axes. Have you ever wondered what to give your Muslim friends for their Eid celebrations? 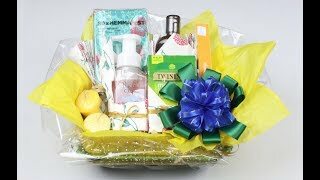 We suggest making a bright and festive-looking gift basket. One important thing to note when preparing food hampers for Muslims is to ensure that the goodies are halal. This means food prepared in a way prescribed by Muslim laws, especially if it includes meat. If you are really worried about getting this wrong, well not to worry. Click to read the blog on how we do it. Small gifts can be a pain to wrap especially when they do not come in a box packaging or if they have irregular shapes. We designed an envelope out of cardstock measuring 6 by 4 inches to add a little more volume to the gift. This adds some element of surprise and mystery when receiving slightly bulkier gifts. We are celebrating animal prints by creating this Jungle-look gift wrapping! Using our Leopard Print wrapping paper, we created an elegant yet sophisticated design using Japanese pleats which is bound by brown and olive satin ribbons. The designer bow and ribbons represent the trees and vines in the jungle, and the bright frangipani centrepiece adds a dash of tropical prettiness. Let's bring animal prints back in fashion!